When most people think about aviation injuries and fatalities, they think of airline crashes. Admittedly, catastrophic crashes usually get the most media coverage. Fortunately, disastrous aviation crashes are relatively rare. On the whole, air travel is indeed the safest way to get from one place to another. Just because a plane doesn’t crash, however, doesn’t mean passengers can’t get seriously injured. Air turbulence is much more common than catastrophic crashes, but it can still cause catastrophic injuries. 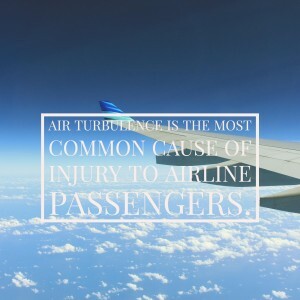 In fact, air turbulence is the most common cause of injury to airline passengers. Earlier this summer, an Etihad Airways flight traveling from Abu Dhabi to Jakarta experienced air turbulence so severe, over 30 passengers were injured and nine were so badly injured they had to be transported directly from the runway to the hospital. You can visit BBC News to read more about this air turbulence accident. In June 2016, dozens of passengers on a Malaysian Airlines flight traveling from London to Kuala Lumpur were injured due to severe turbulence. As reported by the Telegraph, passengers posted photos showing overturned food carts, spilled food, and scattered luggage – all the aftermath of the flight’s path through rough skies over the Bay of Bengal. In December 2015, an Air Canada flight also experienced violent air turbulence that reportedly caused some passengers to be thrown as high as the plane’s ceiling. 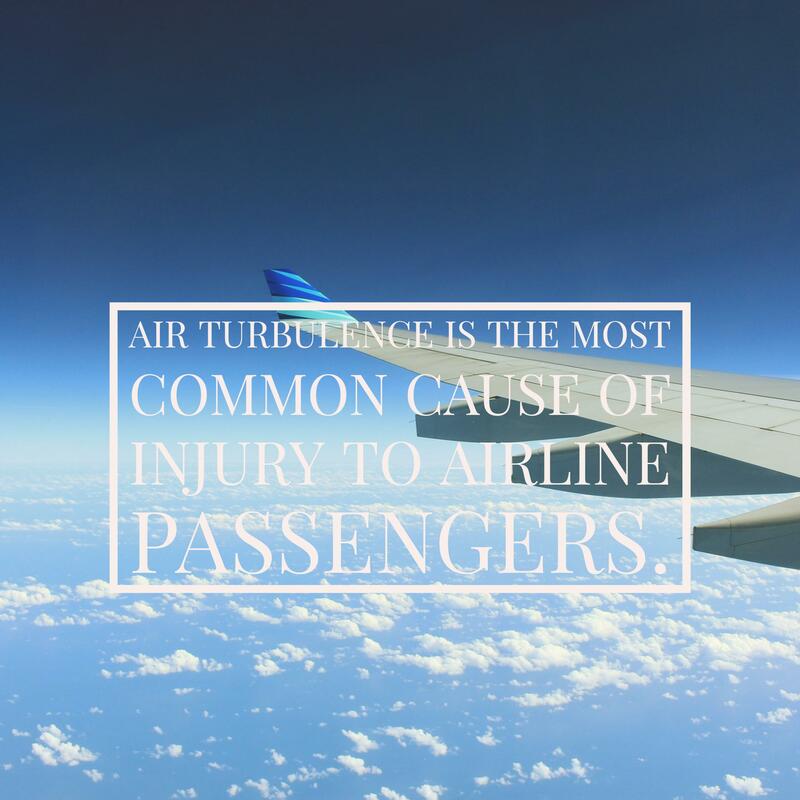 Air turbulence injuries can occur in a variety of ways. Unsecured equipment, such as rolling food carts, is a major source of passenger and flight attendant injuries. Falling luggage is also a problem, with some estimates placing falling luggage-related injuries at 4,500 incidents per year. Passengers can also get injured while walking around the cabin or using the lavatory when turbulence strikes. Unfortunately, because turbulence is often unpredictable, passengers can get caught in a bumpy ride with little or no warning. In the cramped interior of an airline cabin, injuries can occur before a passenger has an opportunity to return to his or her seat. Although fatal air turbulence injuries are rare, passengers can and do get seriously hurt during flights every year. Severe injuries include broken ribs, head and spine injuries, broken ankles, and internal injuries. Passengers can also experience secondary injuries caused by physiological reactions to turbulence, such as high blood pressure caused by the fear and anxiety associated with a violent flight. Who Is Responsible for Air Turbulence Injuries? In many cases, the airline is liable for passenger injuries caused by air turbulence. Although pilots generally can’t detect turbulence on radar, they usually receive warning about impending turbulence from a variety of sources, including other pilots, air traffic controllers, and the Federal Aviation Administration. The airline is also liable for injuries caused by the negligence of flight attendants. For example, an airline might be responsible in cases where a flight attendant failed to properly secure luggage, or in a situation where a flight attendant left a beverage or food cart in an aisle. In other cases, passengers can file a lawsuit against the manufacturer of equipment within the aircraft or the manufacture of the aircraft itself. For example, a defective latch on an overhead storage compartment could cause luggage to fall, resulting in passenger injuries. Each air turbulence case is different, and a passenger may need to file a lawsuit against more than one party or entity to ensure he or she receives full and fair compensation. Attorney Jonathan C. Reiter is an experienced aviation accident lawyer who devotes a significant portion of his practice to helping air disaster victims and their families obtain compensation for injuries and deaths caused by negligence in the aviation industry. He has a long track record of success in the area of aviation accidents representation. If you or a loved one has been injured in an aviation accident, you need the help of an experienced air disaster and injury lawyer. Call 212-736-0979 today for a free case evaluation.